The kitchen, we’ve all heard, is the heart of the home. 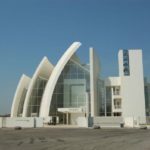 It’s not only the place to prepare food; it’s the gathering place, the homework area, the snack stop, the place where conversations go beyond small talk and face value. As the center of the home’s architectural universe, the kitchen deserves to look its best. 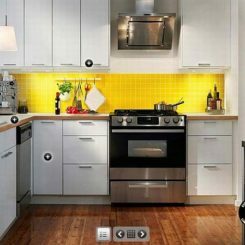 When we think of decorating a kitchen, though, some of us might worry about involving extra decorating “stuff” in a space that’s already maxed out. Not to worry. 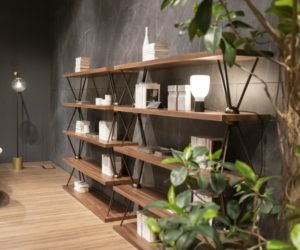 This article will take you through a variety of real-life kitchens and illustrate different ways that one’s style can be achieved without sacrificing cleanliness or counterspace. 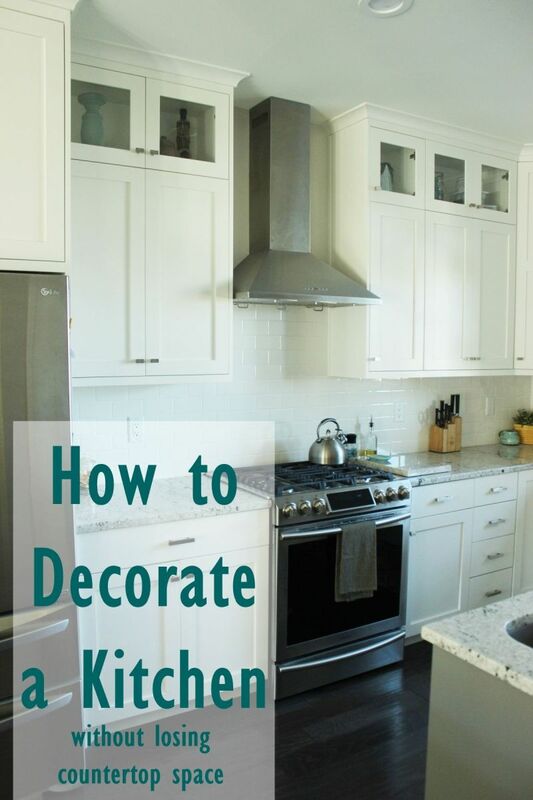 So, now that we recognize its importance, let’s explore just how to decorate a kitchen. 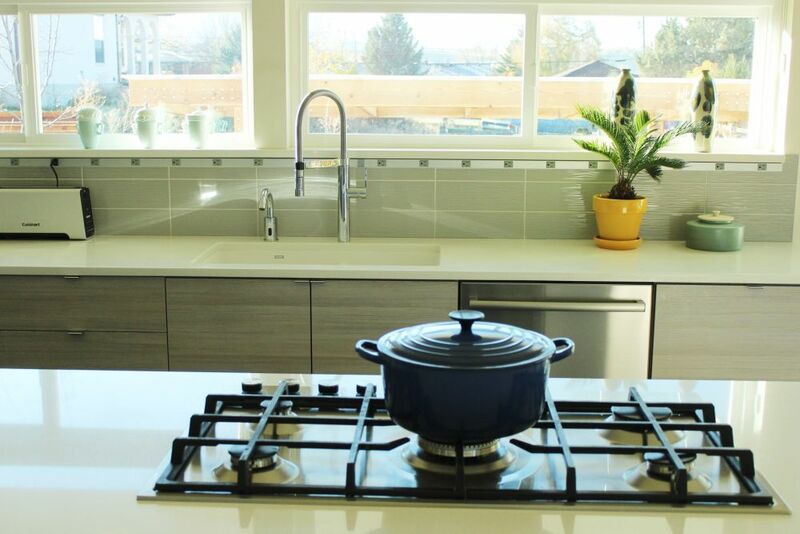 For the open concept main floor in a contemporary home, the kitchen must be more than a place to scrub vegetables. 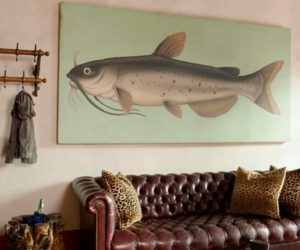 It must carry through the well-edited, modern vibe of the rest of the house. This contemporary kitchen does just that. 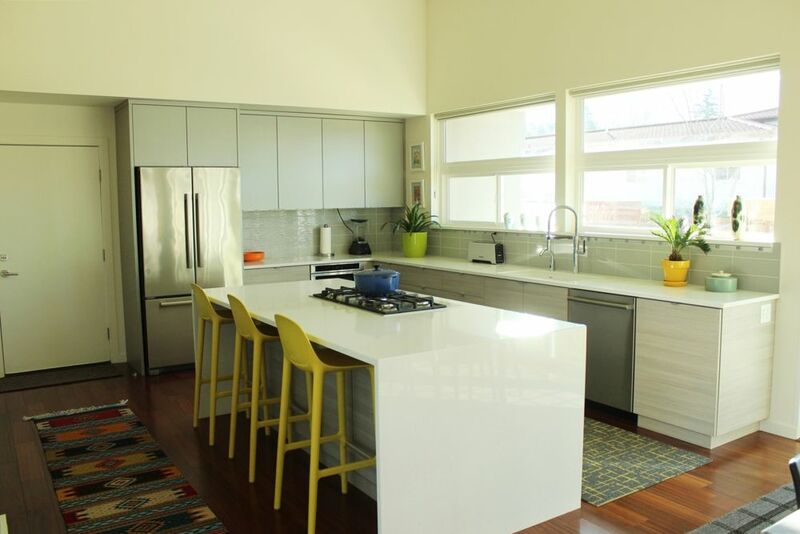 A white waterfall countertop gives the kitchen island clean lines while maintaining an open, airy feel. But to keep the light-neutral kitchen inviting, plenty of rich colors are used strategically throughout. 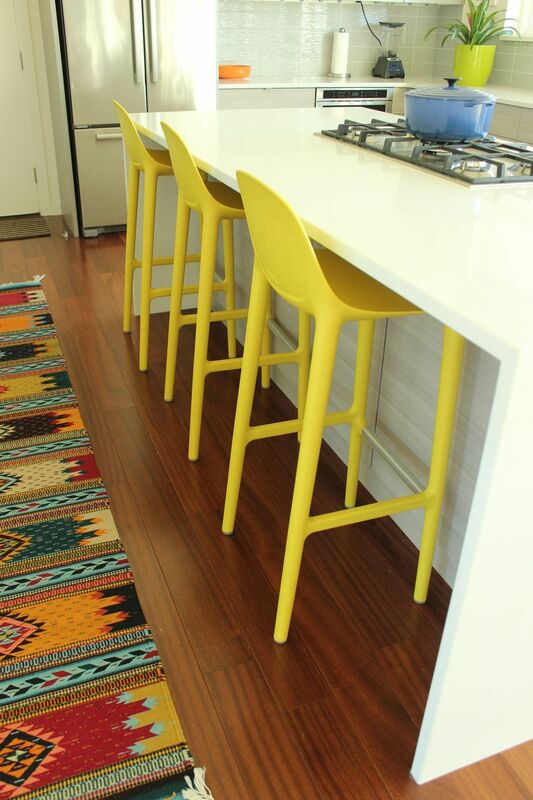 Lemon yellow bar stools, for example, give a pop of color next to a multi-colored runner rug that leads from the garage through the kitchen. 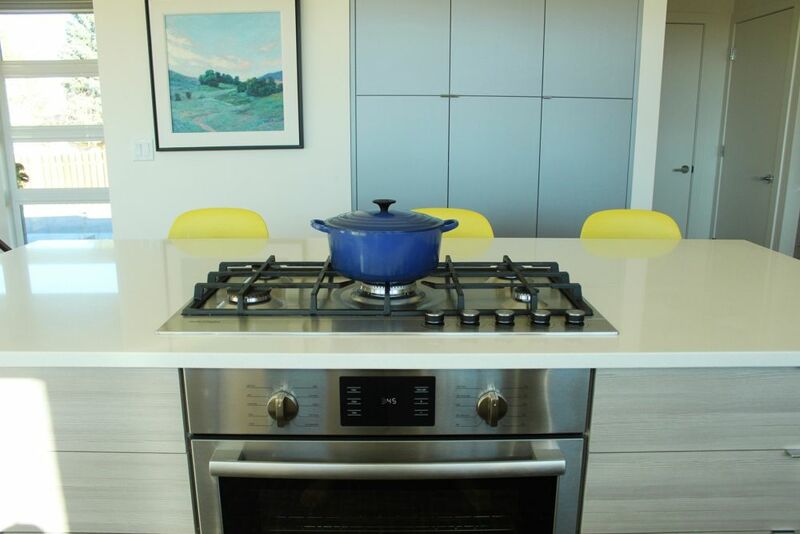 The island also contains a gas cooktop, upon which sits a royal blue Le Creuset dutch oven pot. The classic color brightens the space without being distracting. 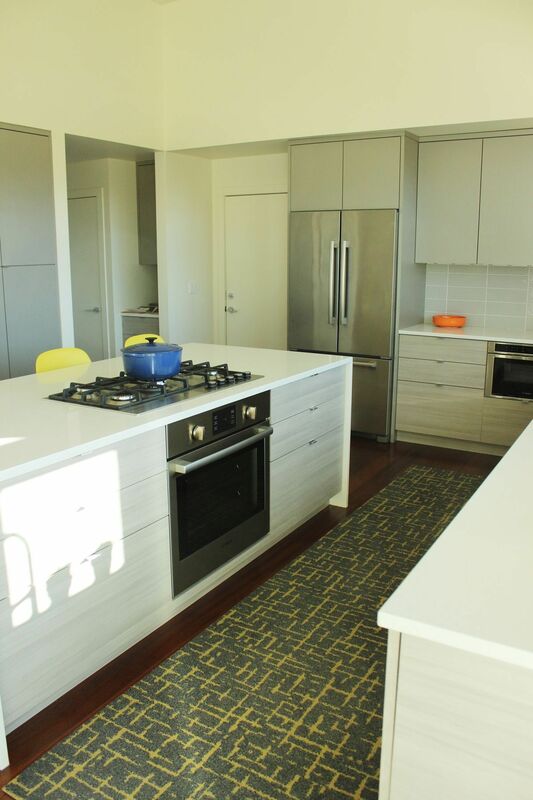 The blue pot also looks well against the yellow chairs and the pantry cupboards behind the island. 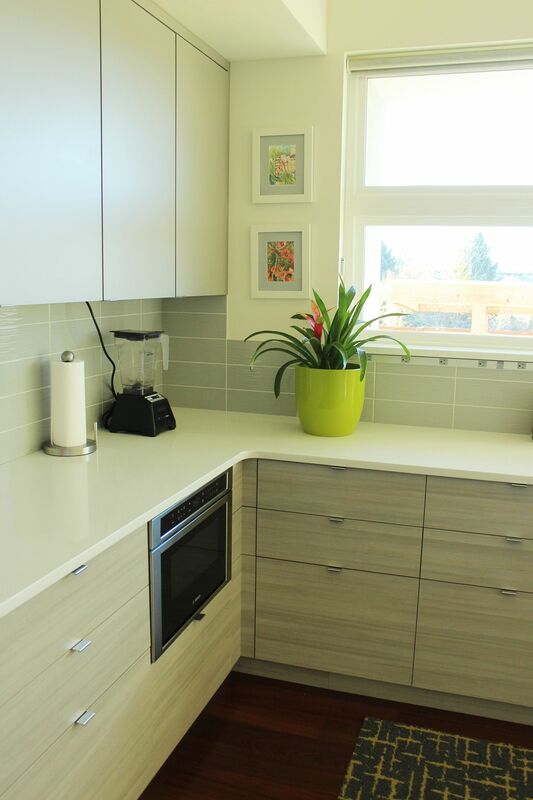 Simple, fresh color chunks in a light, airy kitchen keep the space cheerful and grounded. 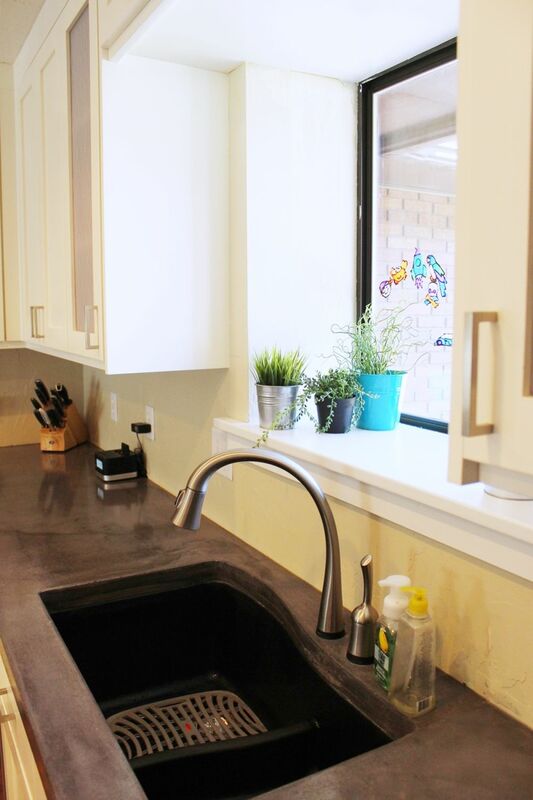 Other solid colors are peppered throughout this kitchen, such as a potted plant near the corner. This is a great touch in the kitchen if you have a window. 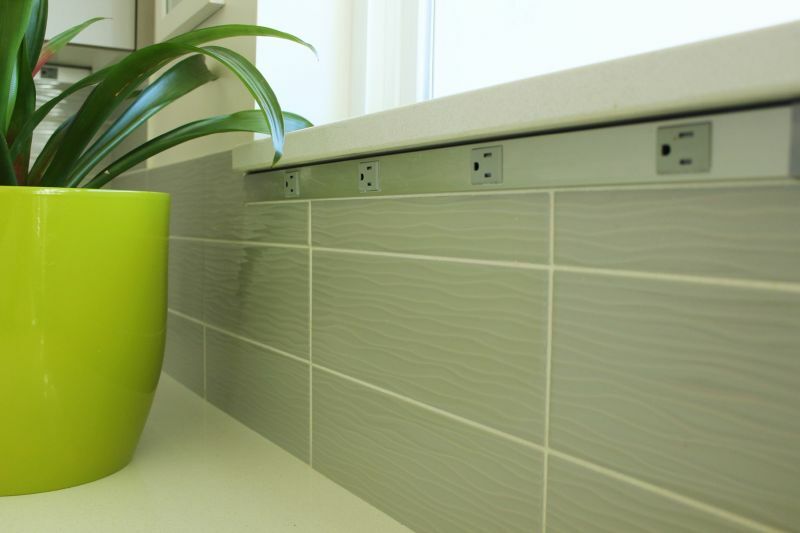 This particular plant is one that maintains a controlled space, which matches the modern environment. An abstract runner rug in a muted blue-grey with yellow splatters carries the color combination home. 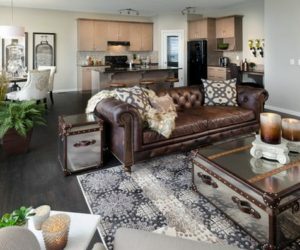 But, because the rug’s colors are a softer version of the other colors closer to eye level, they don’t feel matchy-matchy or overkill on the color infusion. The rug reads almost as a neutral. 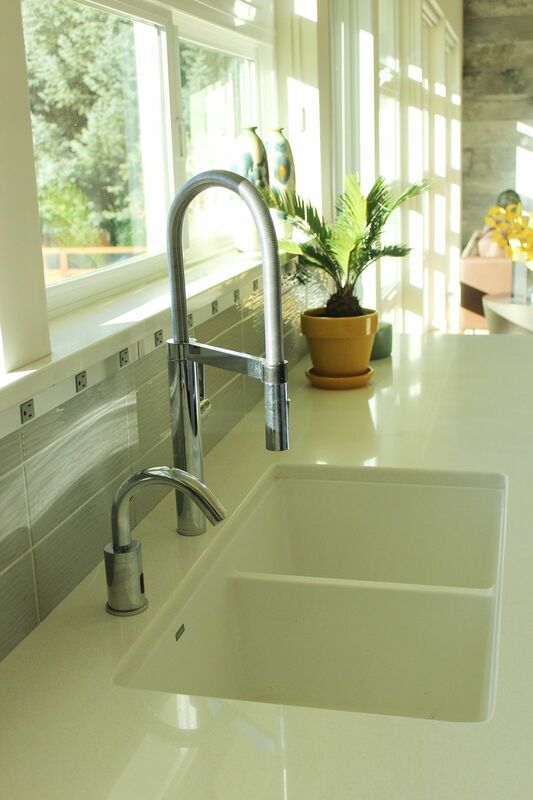 The kitchen sink requires no decoration per se, because a faucet was selected that completely exemplifies the overall kitchen’s style. 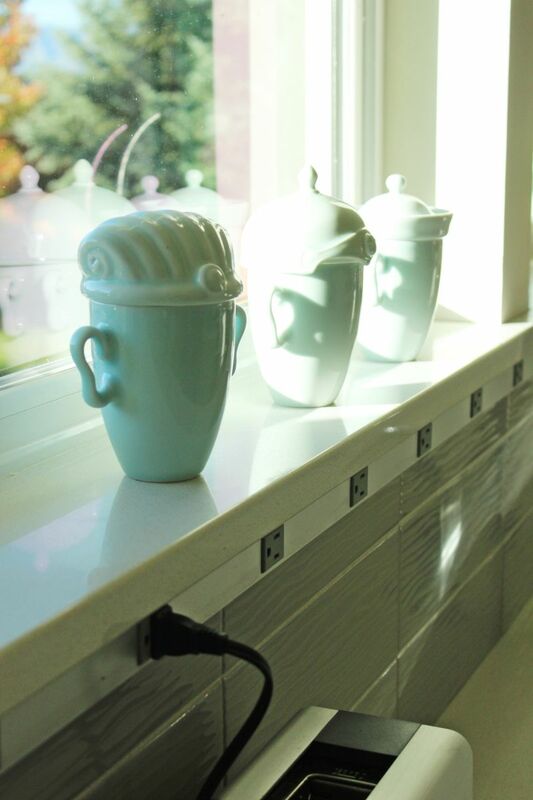 However, for a bit of fun, the windowsill behind the kitchen sink houses similar-yet-individual ceramic statues in pale blue. 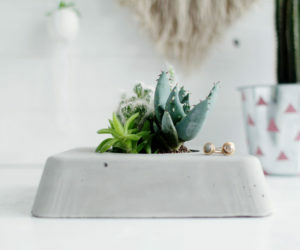 These quirky figures help keep the magazine-worthy kitchen from feeling rigid (a potential in any non-personal decorated space); instead, it feels inviting and beautifully live-able. 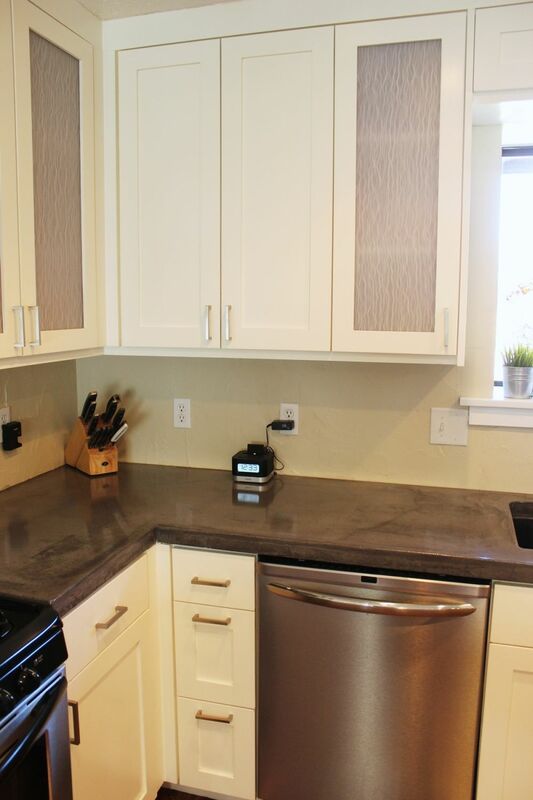 Appliances that are used frequently serve as part of the kitchen’s décor as well. A slim designed stainless steel toaster and a blender sit on the countertop, plugged in and at the ready. 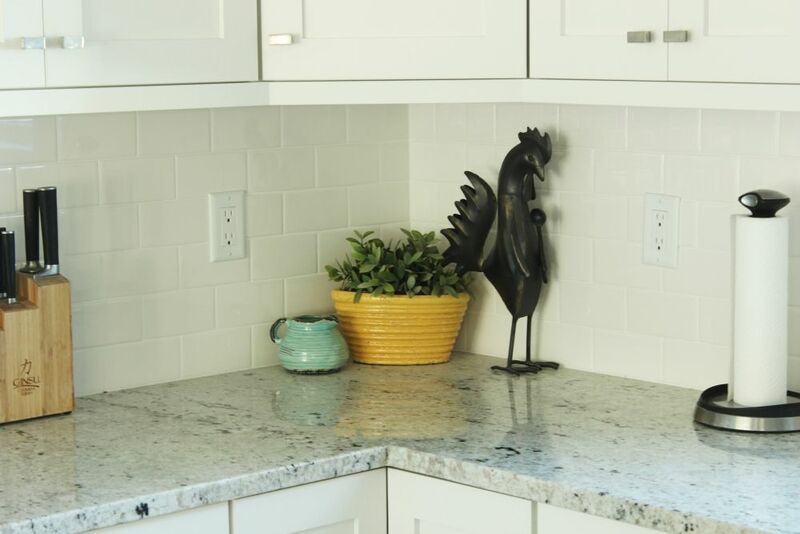 These are positioned neatly against the backsplash, keeping the surrounding countertop space open and available for use whenever necessary. 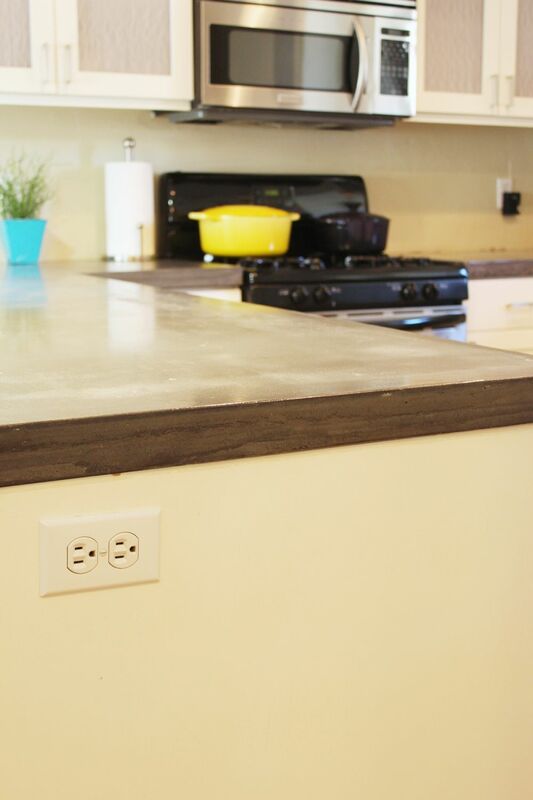 One of my favorite details in the design of this kitchen (great design encapsulates great decorating, by the way) is the outlet strip that runs the length of the kitchen counter, with electrical outlets spaced regularly along. 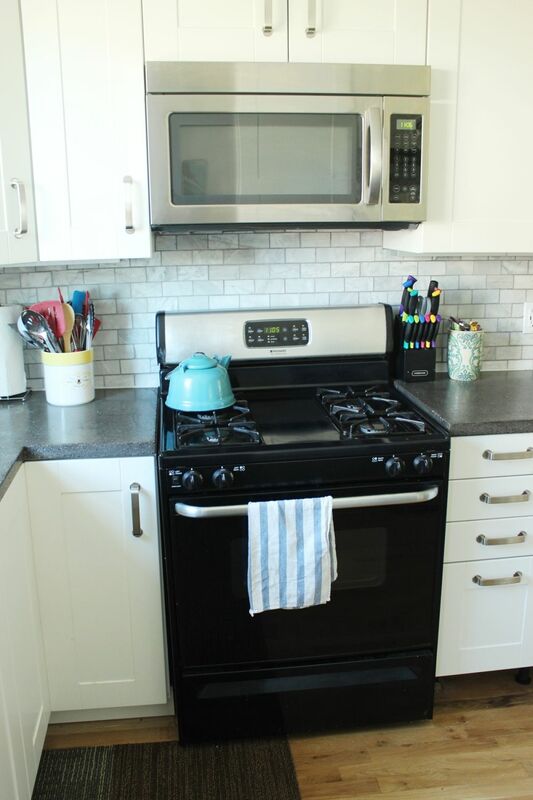 The strip matches the backsplash tile, nicely blending technology with culinary appeal. 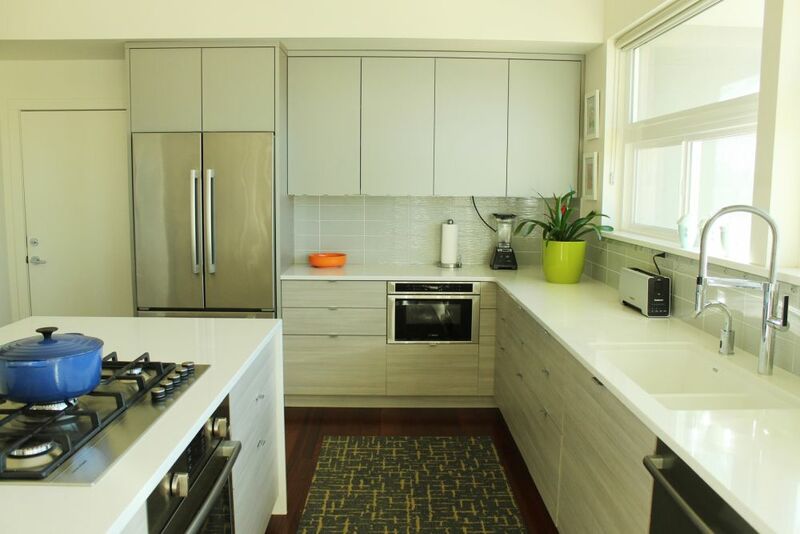 Light, warm grey cabinetry (mostly drawers) maintain a low-profile, horizontal scheme, which coordinates perfectly with the entire space including windows and backsplash tile. 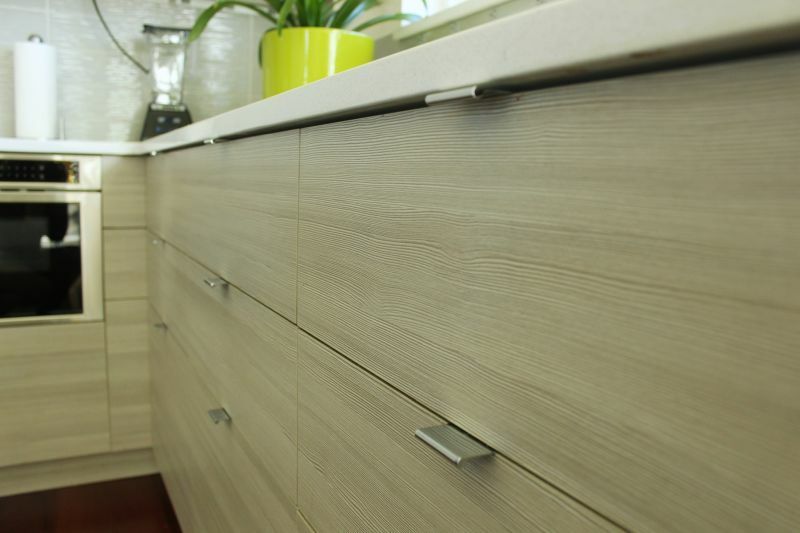 Slim drawer pulls are intuitive and non-intrusive. Such a gorgeous, and perfectly decorated, kitchen. 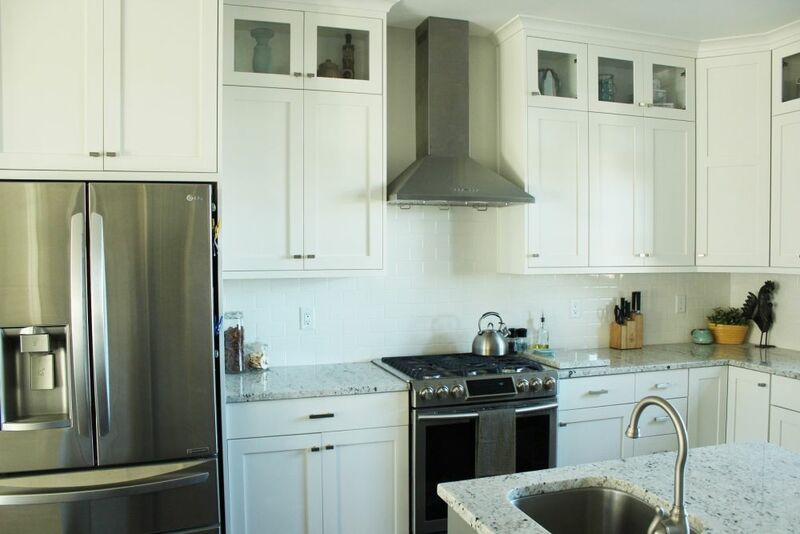 So you’re building a new house or are just moving into a new construction, and your kitchen looks brand new. 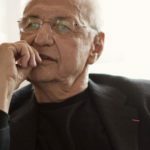 That’s exciting, of course, but the challenge becomes: how do you decorate your kitchen to be different from everyone else’s? 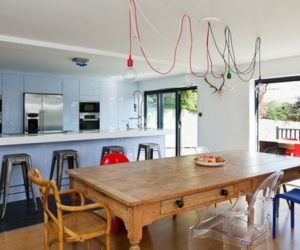 How can your kitchen be uniquely yours? 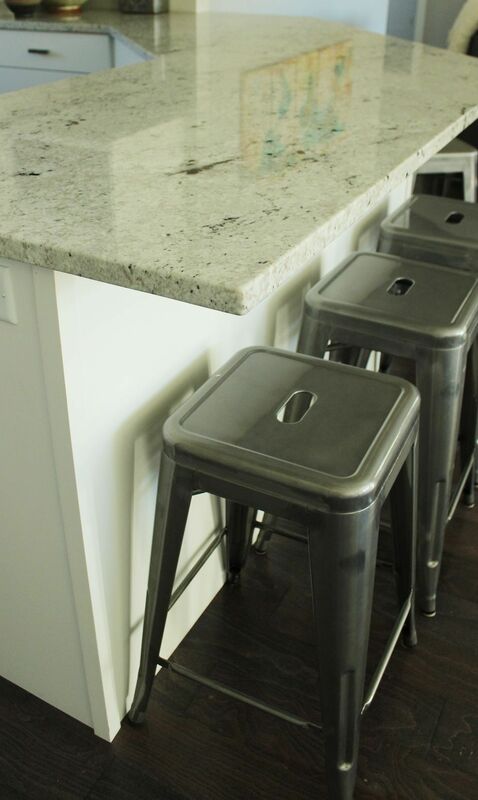 Industrial-style metal bar stools are a good place to start in adding warmth and a bit of modern weathered appeal. (“Modern weathered” – yes, that’s a thing. As of now.) 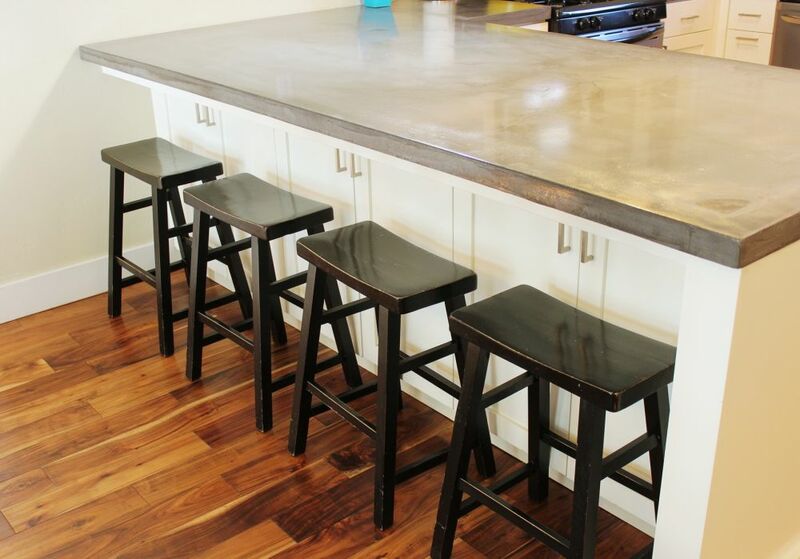 An uncluttered peninsula countertop is an unspoken invitation for anyone to come, sit, and stay awhile. 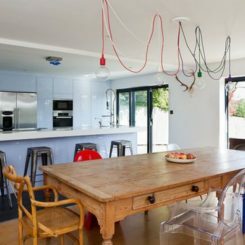 Simple glass pendant lights help to keep the kitchen feeling open and orderly, but with a bit of elegance included. 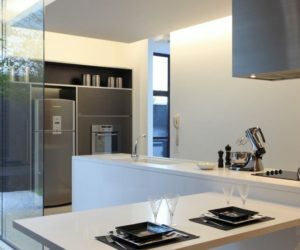 Glass pendants look well in practically every style of kitchen, because they’re very versatile, visually lightweight, and timeless. 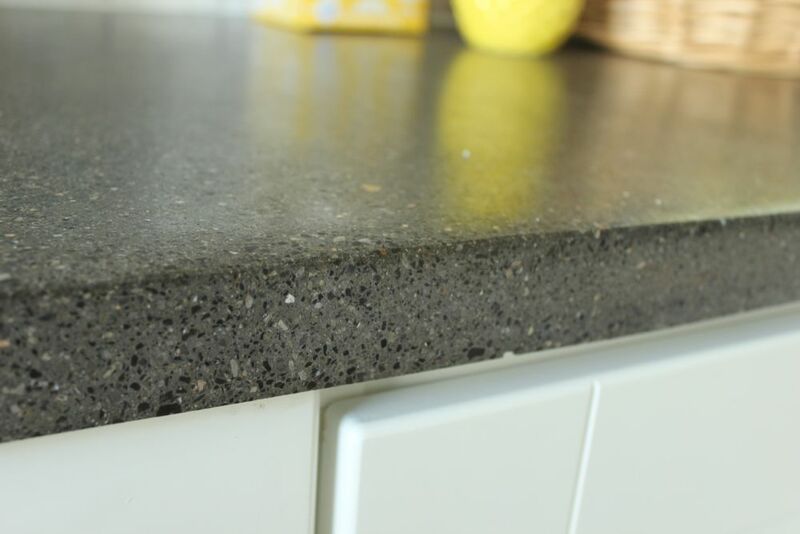 Kitchen corners can be a bit tricky, because they look harsh when left completely exposed and plain, but they have the potential to collect all sorts of clutter, whether on purpose or not. 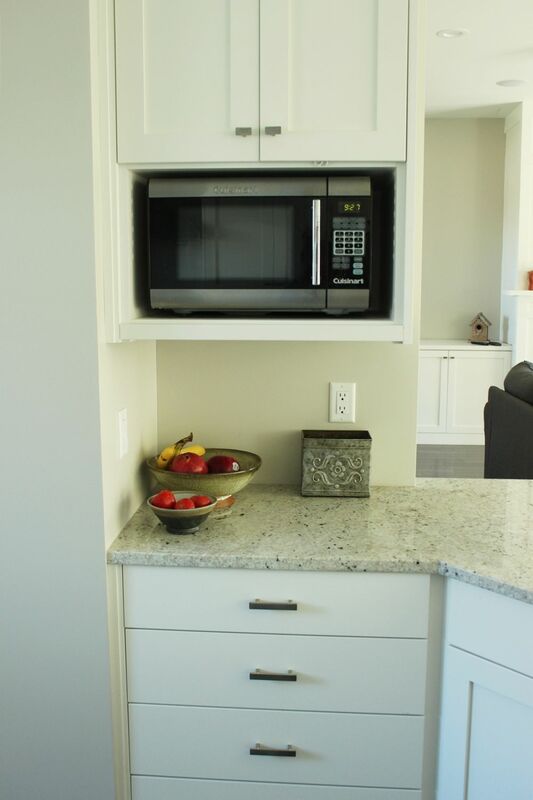 Consider your kitchen corners with a critical eye, then be strategic about what is allowed there. A couple bowls of produce might be all the “decoration” the corner needs…and if that’s true, then don’t let other stuff creep in. 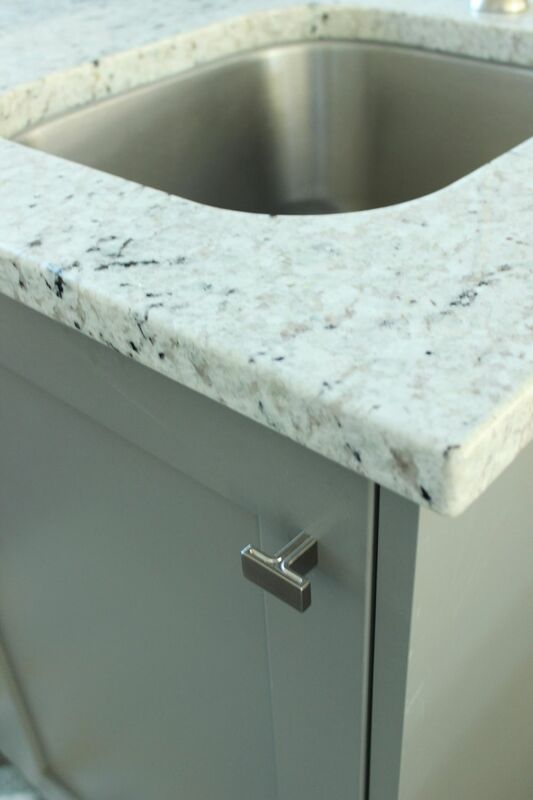 A kitchen island, no matter how small, can be so useful, especially one that has a small work-sink plumbed to it. 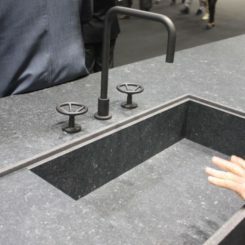 This setup allows other kitchen countertops to be used by people keeping the chef company (or helping her/him!) while maintaining conversation and interaction. 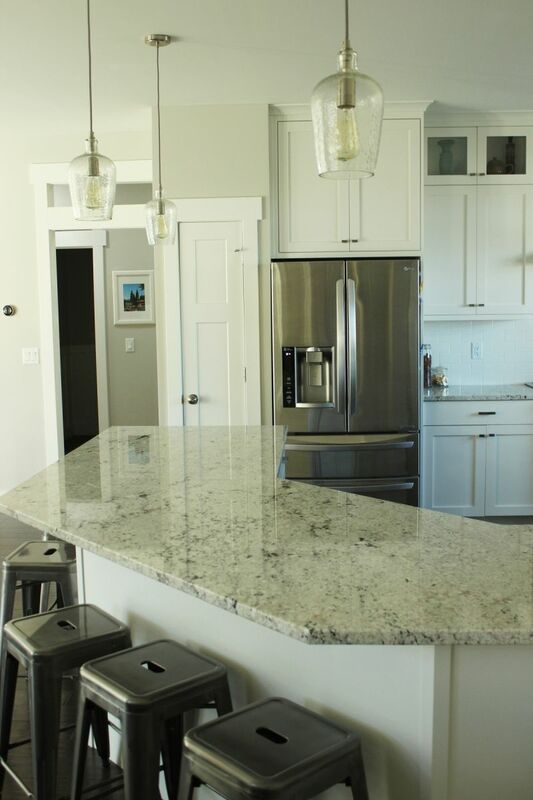 Because a kitchen island should be kept clear of clutter whenever possible, the decoration lies in small details such as the choice of countertop and the hardware. 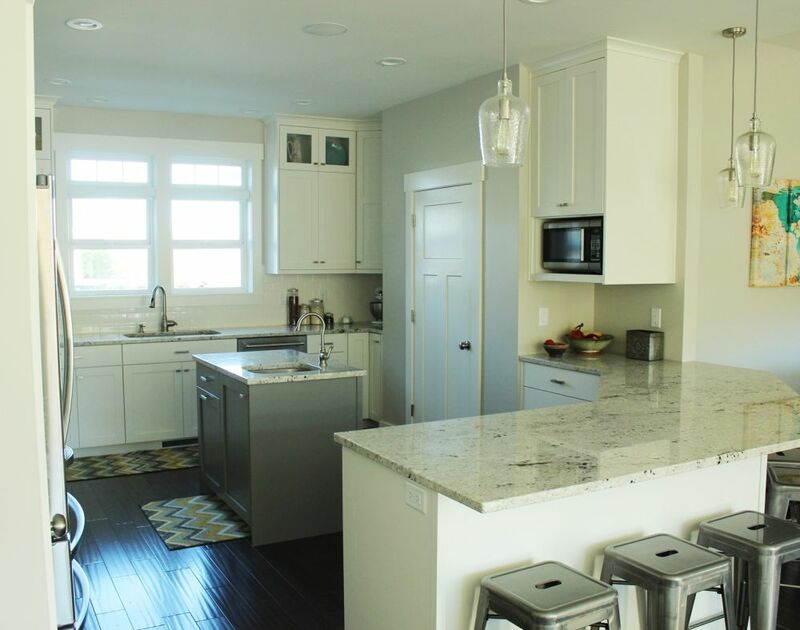 Keep the aesthetic of both proportionate to the size and style of the island itself. 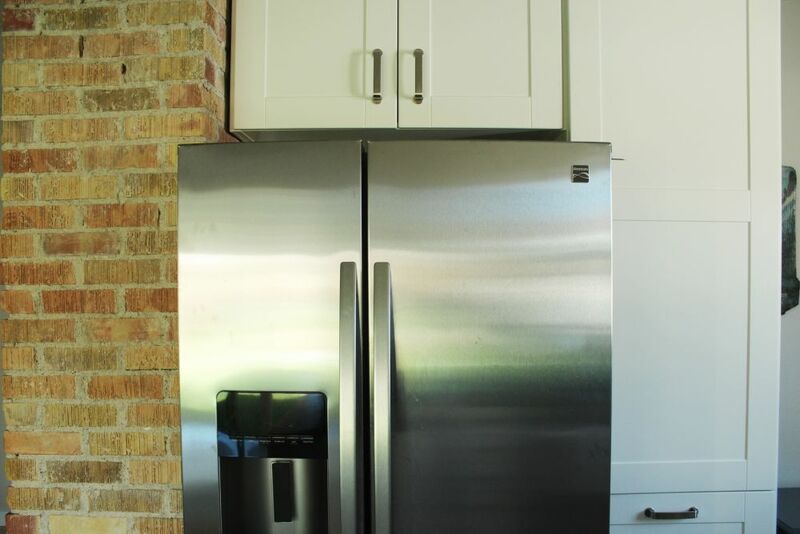 A stainless steel refrigerator looks well with a stainless steel hood. 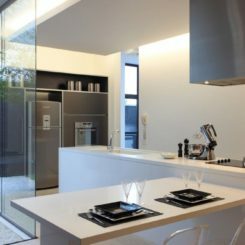 The combination visually spreads out the steel within the all-white kitchen, providing balance and aesthetic appeal. Another corner decoration includes a little color. 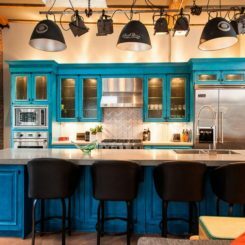 Solid colors tend to work the best in the kitchen, because they provide color without visual clutter. Vary the height of objects if you use more than one. 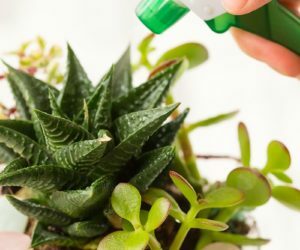 Often, you can “decorate” with useful cookery items, such as ingredients that you use frequently in glass jars on the countertops. 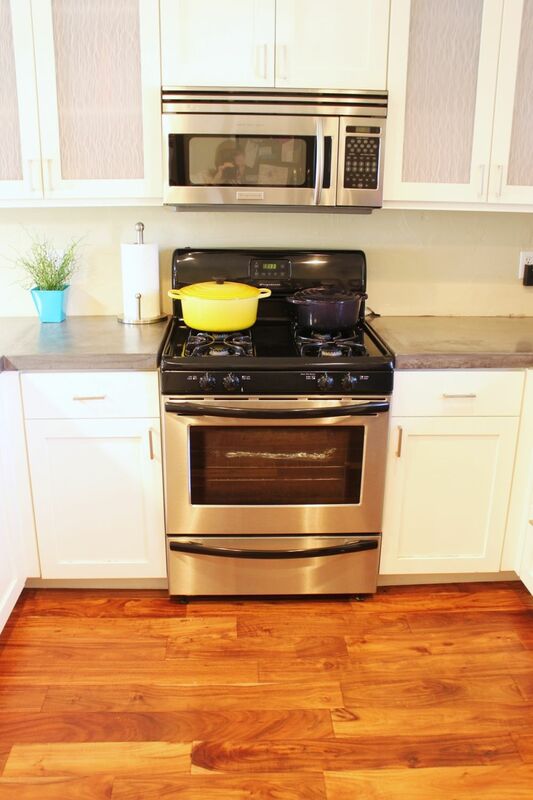 This works well in large kitchens, where the ingredients can lend a spacious kitchen a little cozy charm, and it also works well in smaller kitchens, where cabinet space might be at a premium and housing the ingredients on the countertop frees up a cabinet to store other (uglier) kitchen stuffs. 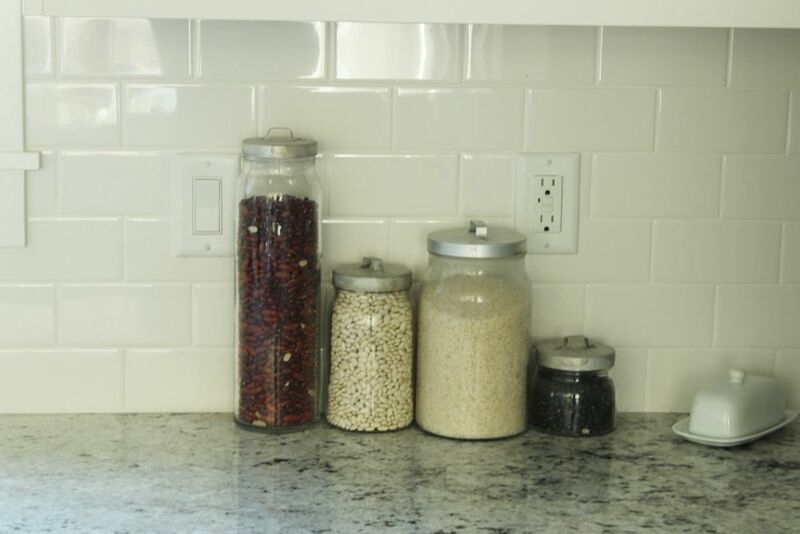 Keep the jars limited, however, to three or four, and leave plenty of blank backsplash space on either side. 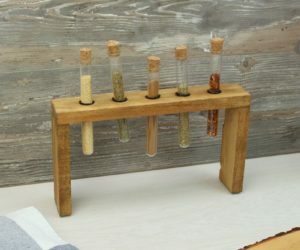 This helps the jars to feel more decorative than cluttered. 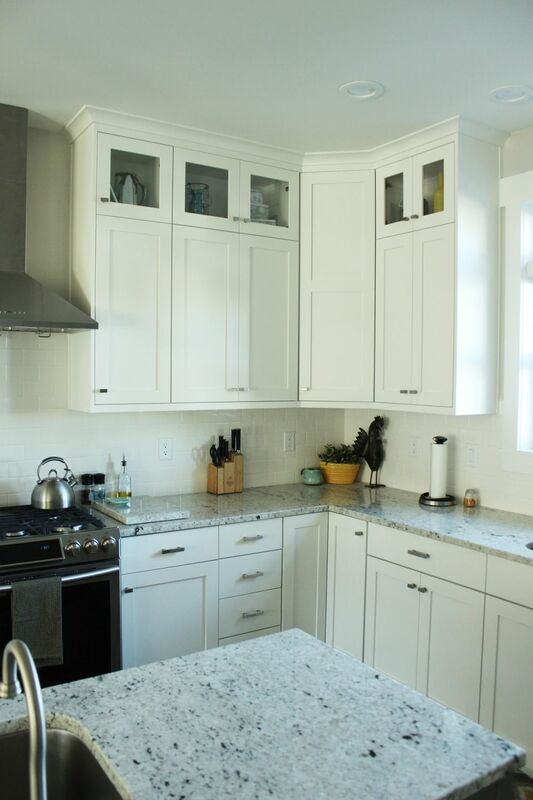 This kitchen’s upper cabinets are small cupboards with glass doors. 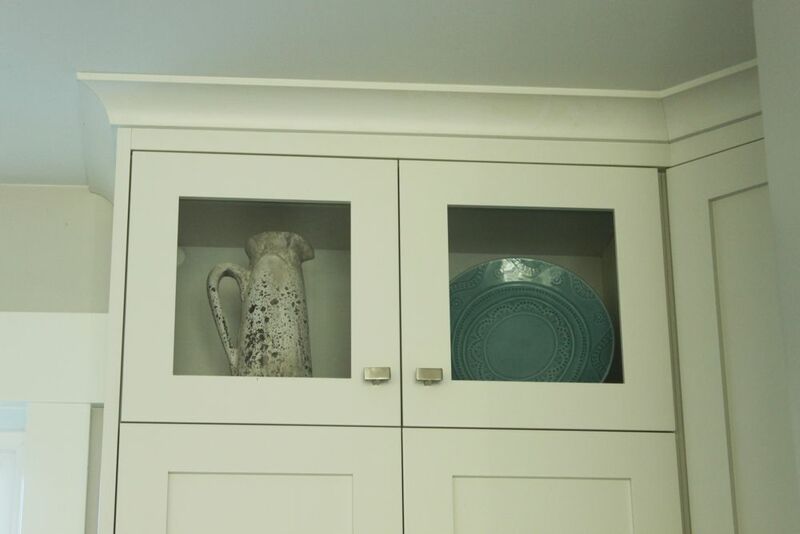 If you have open shelving or exposed cupboards in your kitchen, you could do something like this: place similar objects in the visible spaces as decorations. 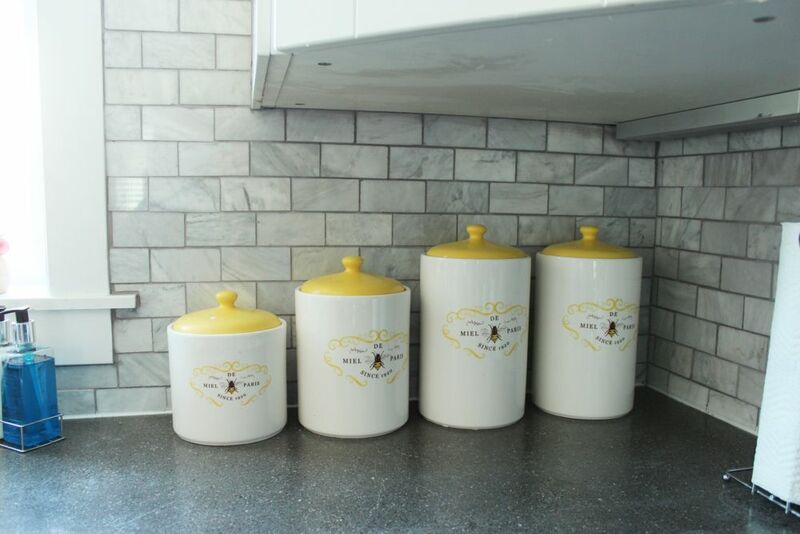 In this kitchen, the similar objects are vintage- and cottage-inspired ceramic pieces. 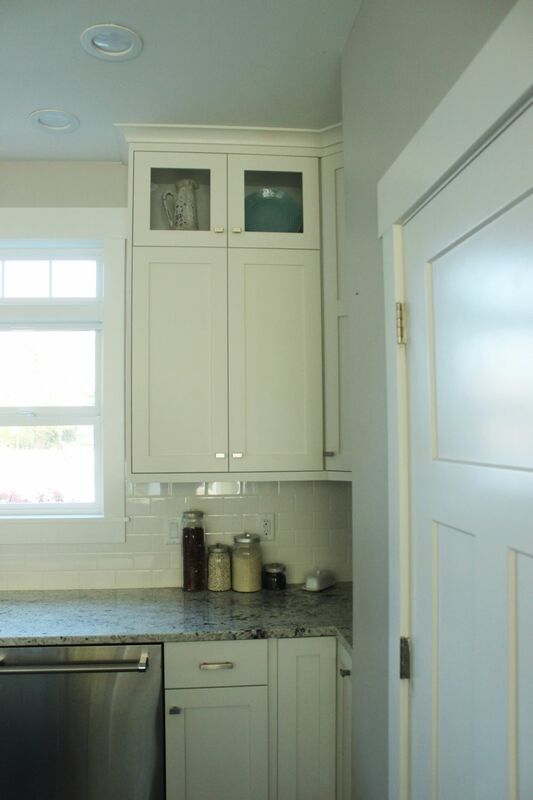 The glass doors are found at the top of every cabinet in this kitchen, and a single ceramic piece is displayed in each. The effect is homey and charming, clean and fresh. 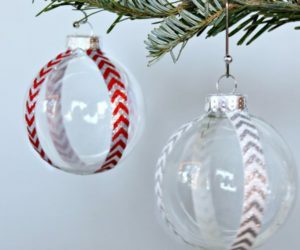 So, ultimately, when you have a place for your “decorations” built in (in this case, literally) to your kitchen décor, it helps you maintain order and clutter-free zones everywhere else. This is a great decorating tip for any space, but especially for a room as function-focused as a kitchen. 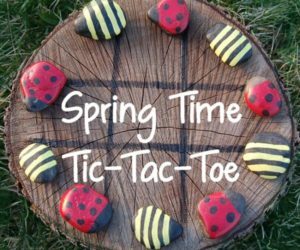 For those of us who can stand in the center of our kitchens, stretch out our arms, and touch everything when we spin around, decorating can be a challenge. There’s just not room for much extra! 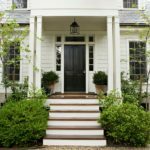 If you’re in a small apartment, a bungalow, cottage, or anywhere else where the kitchen envies the size of a postage stamp, you’re not alone. 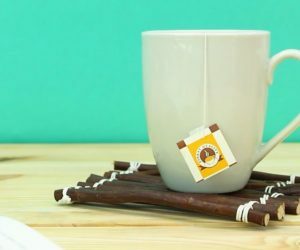 For starters, a teapot that’s ever-present on the stove serves multiple purposes: (1) it’s ready whenever you need it, (2) it frees up the cabinet space that would otherwise be required to store it, and (3) it adds charm and color. This is one of the best (and simplest!) 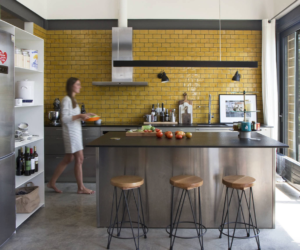 ways to blend form + function in a tiny kitchen space. 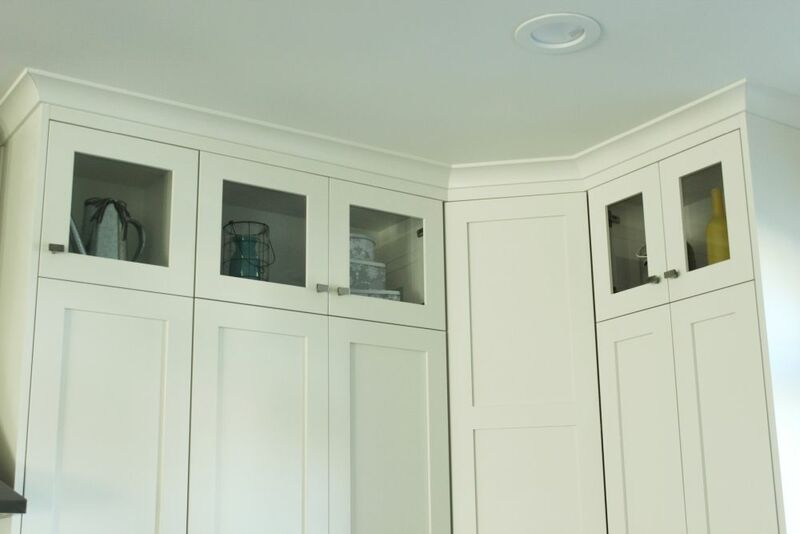 Another way to free up some cupboard space is to place things (baking ingredients, for example) into matching canisters on the countertops. 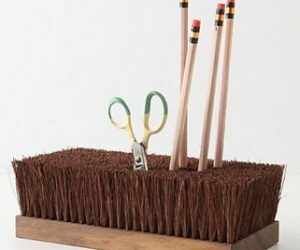 This works well in a corner, particularly, because it softens the corner and doesn’t allow you to put anything else there as extra decoration, which can be a temptation for countertop corners. 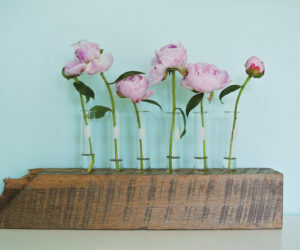 Keep these simple for best aesthetic appeal. Opposite the oven is an exposed brick wall, a modern stainless steel fridge, and a tall pantry cupboard all in a row. 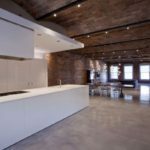 I love the industrial feel of the aged brick next to the more modern finishes. 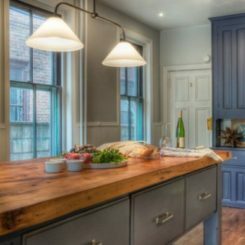 It doesn’t take a lot to make a big statement in a tiny kitchen; that’s one major advantage of decorating small spaces! 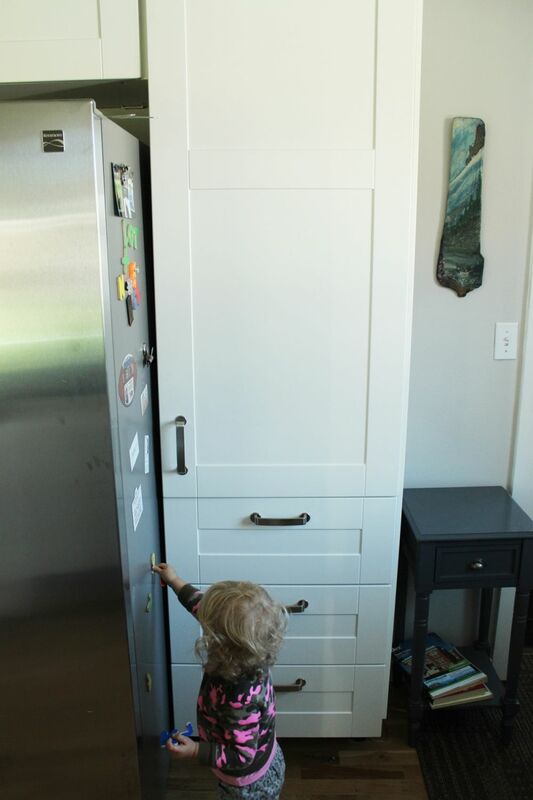 For the tiny people that often hang out in the tiny kitchen while people are cooking, it’s a lovely idea to have something available to keep them occupied. Magnets on the less-visible side of the fridge, for example, work great and don’t interfere with the kitchen’s decor. I’m a firm believer of function coming before form when littles are involved, but when the two can work together, it’s like magic. 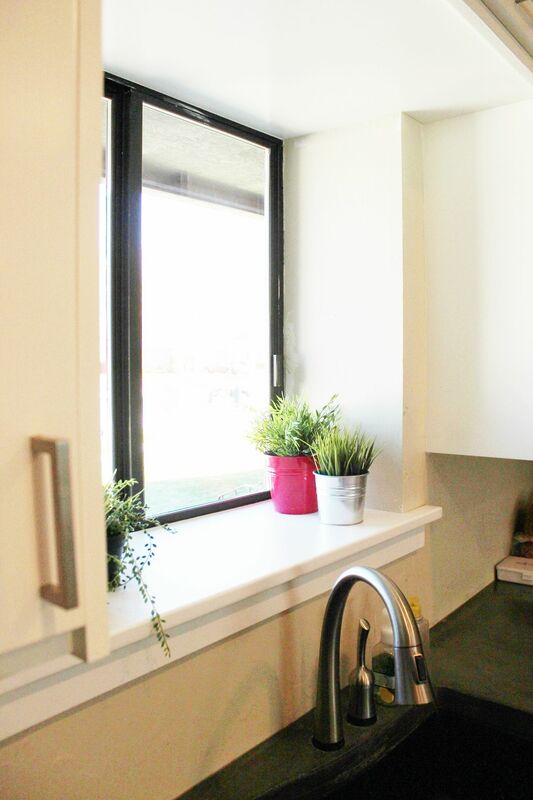 Even the tiny kitchen that has a window is lucky. 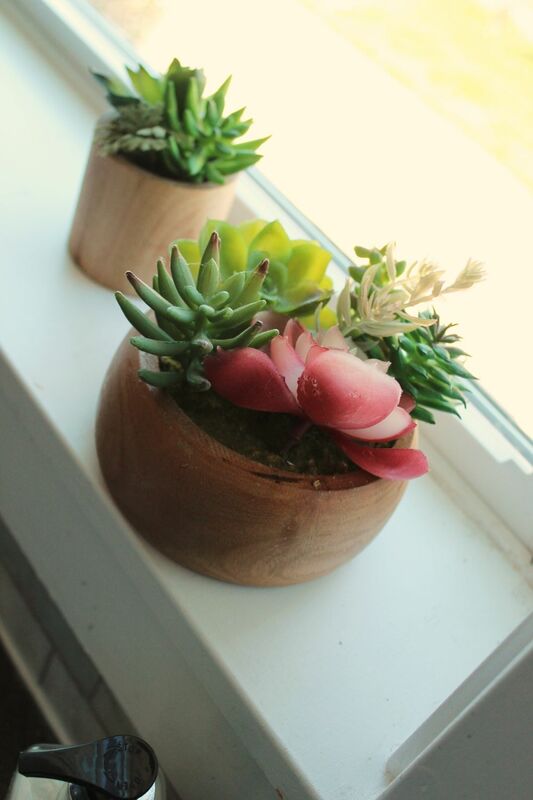 That’s prime real estate for living, growing things like some succulents in a flat pot. 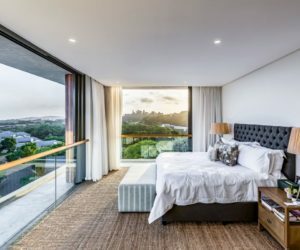 Greenery is a simple decoration in any space, and it’s incredibly effective in providing visual warmth, color, and approachability. 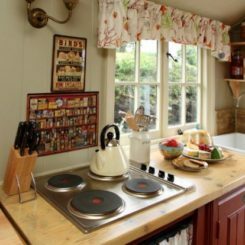 This tiny kitchen is decorated simply and effectively, ensuring that all who come here feel like part of the family. Nothing is off-limits, and yet everything is in order. 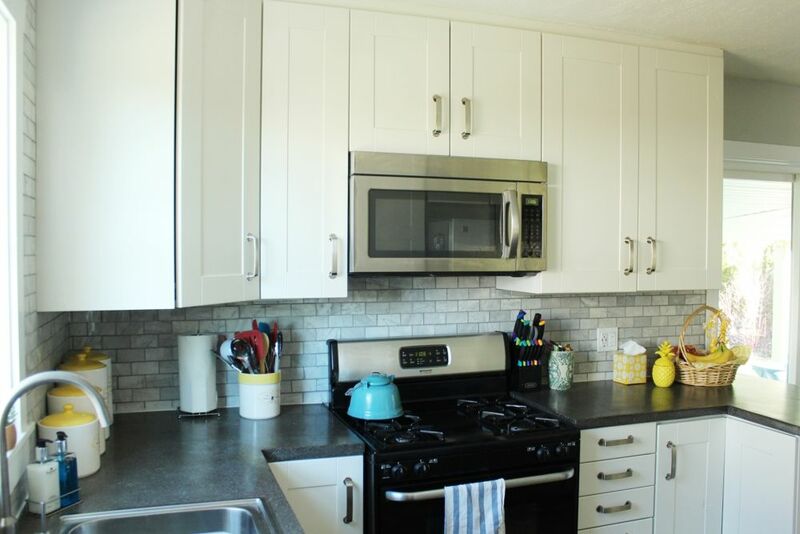 For all the talk of challenges surrounding decorating small and galley kitchens, a mid-sized square kitchen can sometimes be just as hard to decorate. 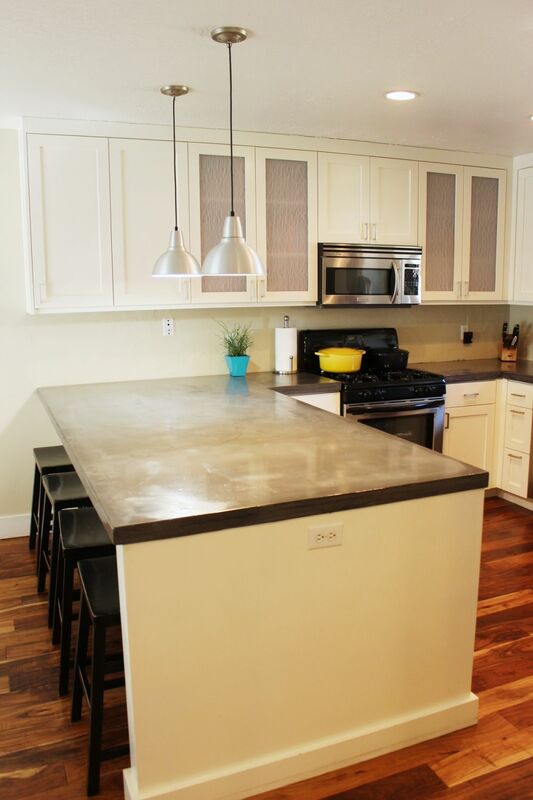 Too small for an island but too big for a cozy work triangle, this kitchen can pose significant decorating dilemmas. 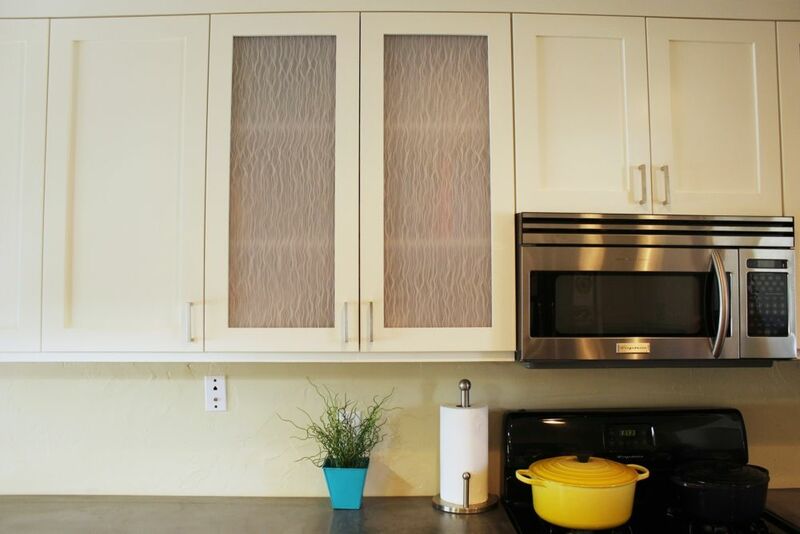 Some ways to make decorating a square kitchen easier include installing frosted glass cabinet doors periodically. This helps to break up the vertical space that could otherwise feel a bit like a box. 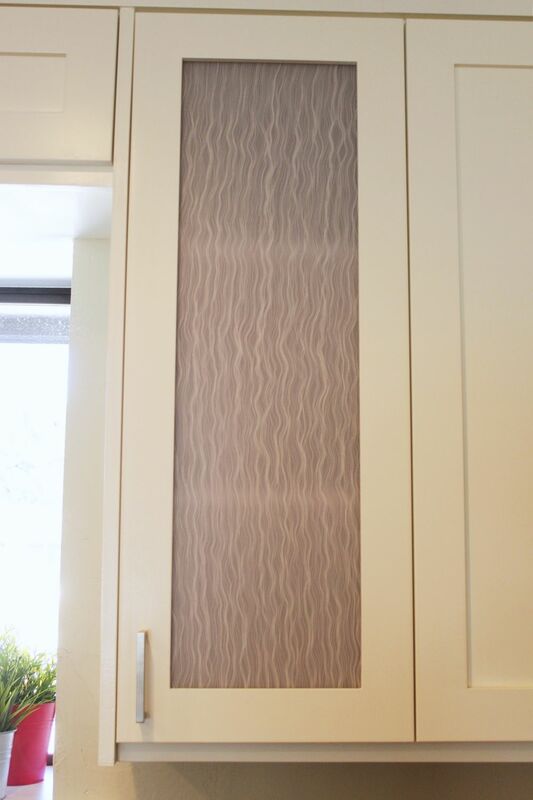 In this kitchen, frosted glass panels were used at the end of each cabinet section, serving as sort of a lovely visual frame to the cabinet uppers. 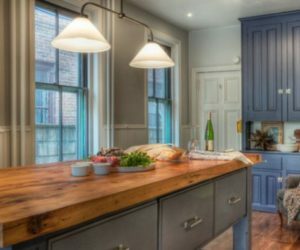 Blue and yellow make a good kitchen color combination, as we’ve seen already in this article, and the same holds true in a square kitchen. 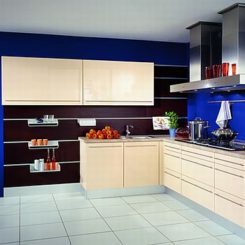 Remember that, when a kitchen is all white or even neutral, a single piece that holds color will stand out in a big way. Less is more here. 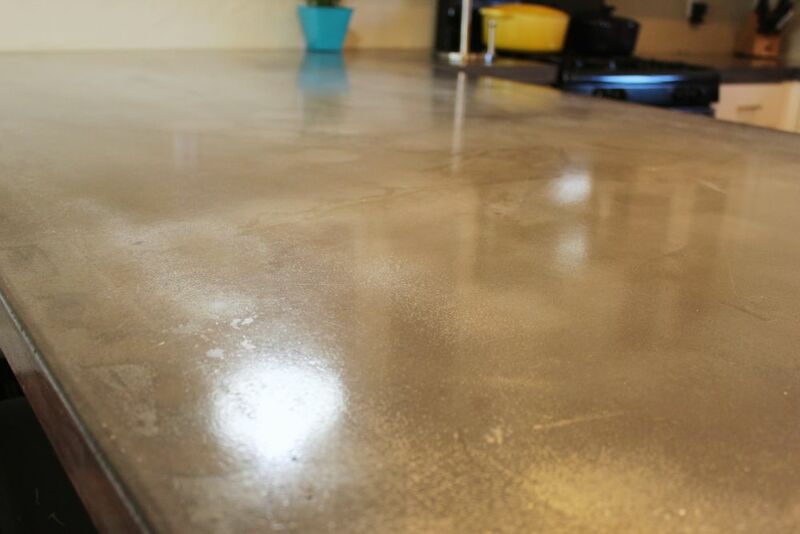 Concrete countertops, sealed in a high gloss sealant, give this kitchen a decided industrial flair. 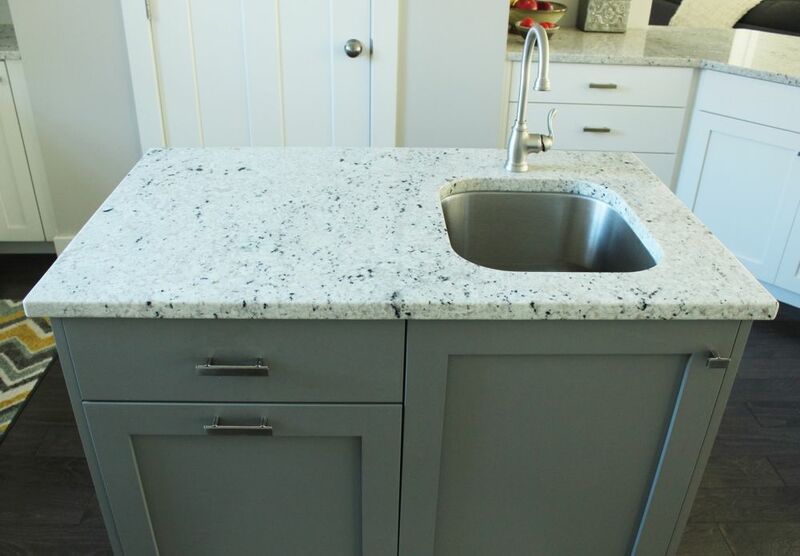 With beautiful countertops, you really don’t have to worry much about decorating; keeping them clear and visible can be decoration enough. 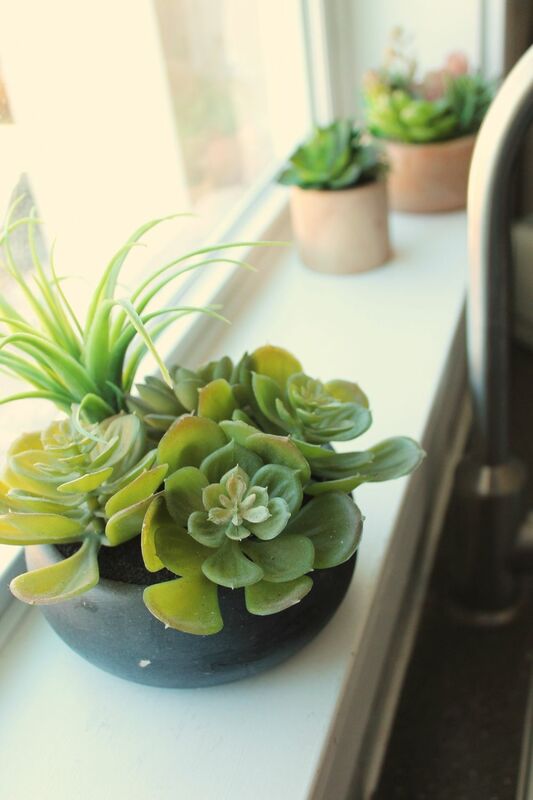 Plant life in the kitchen window. 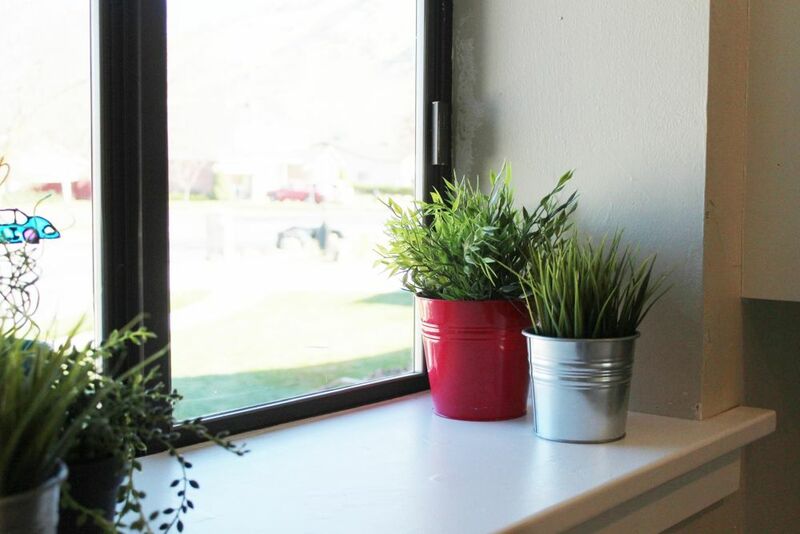 This is a deep window sill and would be a prime spot for a small herb garden, year-round. Children’s window artwork. 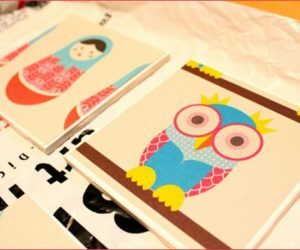 Maybe you love it, maybe you don’t, but it’s a thing for those of us with budding artists who insist on prominent display. Make the most of it, like throwing in a potted plant in a coordinated color so it looks intentional. 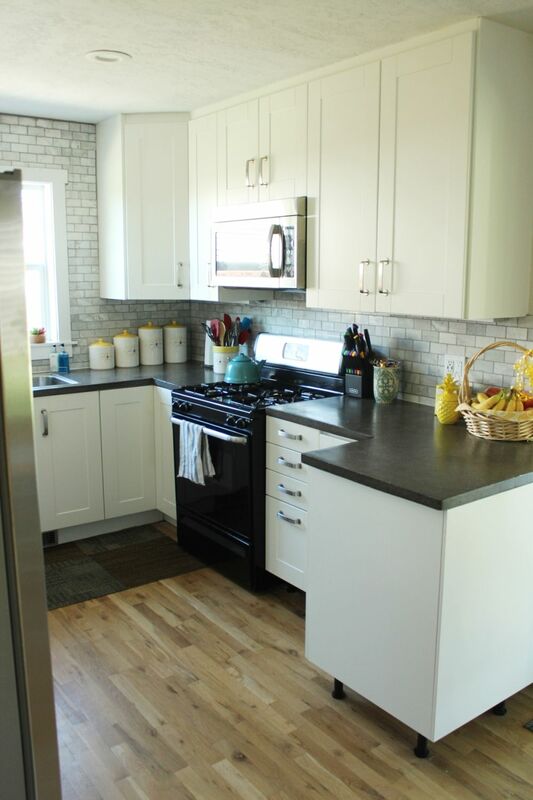 Farmhouse-style wooden stools painted black provide a nice warming touch to the cool kitchen. 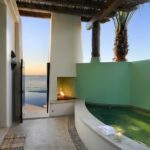 They are narrow in depth, which is helpful when they’re pushed in because of the walkway directly behind the kitchen peninsula. Function will always make form look even better. Every time. 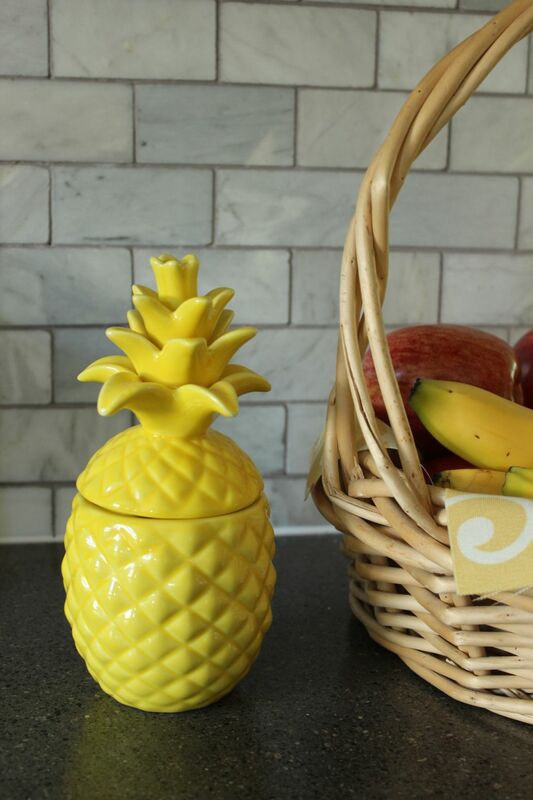 What are your favorite tips and tricks to decorating a kitchen? 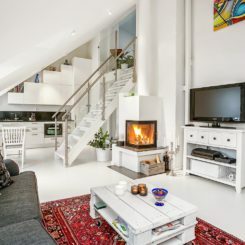 Do you think it’s a space that needs, or is benefited by, decorating? Either way…we hope you enjoy creating a kitchen space that suits your needs beautifully.